I’m here, basically, because I have picked up something special about Old Donation. You focus on what you do Monday to Saturday! I like that. The marks of living better Monday to Saturday are love and justice. We do what we can to make the world more loving and more just. Love always needs definition. Here’s one – biblically based and stated afresh. Love is seeking to value another without limit and helping him or her to make the best use of their God-given talents. We love face-to-face. We can’t love a crowd but we can be just. We can work for everyone to have equal access to the good things in life – to whatever helps everyone to find and use their God-given talents. Justice is the “public face” of love. Loving and being just are our job as Christians. Each of us is a member of Christ by baptism. We are Jesus’ hands and head and heart and voice – doing what we can to make the world a better place. We are members of Christ on mission. 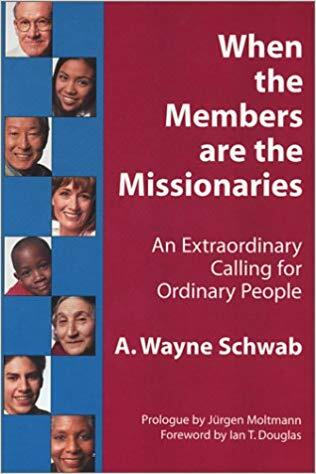 Call it “member mission.” Members on mission can do even more than congregations on mission. It’s time for a story – a true story. Eddie leads a practice group in his law firm. A practice group is a team that works in a special area such as real estate or wills. When he took over his practice group, it had a bad habit. The bad habit was blaming. When a lawyer lost a case, all the lawyer got was blame. “You should have . . .” “Why didn’t you . . .” Lawyers, like all of us, need the respect of their co-workers. When you get only blame, you don’t do your best work. For Eddie, that blame had to end! He announced a new way to deal with lost cases. Losing would be everyone’s concern. As a whole group, they’d analyze what went wrong so they could learn what not to do and what to do next time. Yes, he made sure the lawyer losing the case knew something wrong had been done but everyone owned the loss. And Eddie had a partner to help him – Jewish but also committed to caring and fairness, to love and justice. The result? Everyone relaxed. Now every lawyer’s door was open to the rest. A lawyer could walk in any lawyer’s door and ask for help. They won more cases and clients increased. That’s a neat phrase – “your trophy-adorned walls.” You can forget that your talents were given to you. You developed them, sure, but you were given specific talents to start with. Your trophies are gifts, not rewards! Eddie backs up that talk. Last week, he was about to walk into a courtroom with a new lawyer in training. He asked, “Have you done your praying?” “Praying for what?” came the startled reply. “That justice be done.” A great prayer – that justice be done. There are three lessons in Eddie’s story. First, when Eddie comes to work, he comes to it as a mission field. It’s not just a work place. It’s a place for mission – a place to do God’s work. God is at work here. God has something for him to do here now. It’s always specific. Sometimes, it is done in a week. Sometimes, it is ongoing – like this one to replace blame with teamwork. Eddie comes to every part of his life that way – his home life, the community he lives in, the wider world – he has his opinions about how to get health care for all – his play time or leisure, his spiritual health, and his church – he’s the president of his church’s official board this year. Eddie comes to each of these places expecting God to have a specific mission for him there – in that place. All of us – the baptized – have joined Jesus’ mission. Jesus has a mission for each of us in each of our seven daily places – our homes, our work (paid or volunteer or school), our community, the wider world, our play places, our spirituality, and our church life. That’s the challenge in Eddie’s story. Come to each part of your life as a mission field – a place where the Lord has something specific for you to do right now. Now for a second dimension of Eddie’s story. How do we find what God wants us to do in each mission field? God’s works are love and justice. Where you find love or justice, God is at work there. Where you find love and justice are needed, God is already working to bring love and justice. That’s what Eddie does. He takes over a practice group suffering from the bad habit of blame. He believes we are made to care for each other – at work, just like any other place. The lack of care was Eddie’s clue that God was there. What were the signs God was at work there? Grandiose? Pretentious to trust your own feelings to that extent? Don’t miss what’s at stake. This is a huge firm and a hugely successful firm. Eddie will have to take on the top partners to make this change. There’s a cost here. God’s work, God’s missions always cost. It’s another sign that Eddie is on the right track! A third dimension of Eddie’s story is how did he ever come up with this way to change the blame game – to treat a lost case as a time for analysis and learning by all. I love his answer. I wrote it down. Sure, it’s common sense! These are signs anyone can see: a consultant’s advice; reading; a spouse’s opinion; one’s own thinking. Eddie’s eyes of faith saw clues for what to do. They were God’s clues for what to do. A clue is a hint for solving a puzzle or case. These were the Spirit’s clues. Jesus promises help and breathes on us the Holy Spirit. The Spirit is giving Eddie clues for what to do. See a lost case as everyone’s problem; analyze together what went wrong; learn what not to do and what to do the next time. There’s a risk. It might not have worked. Its failure could have damaged Eddie’s role as the leader of his practice group. Faithful decisions are like that. You don’t know they are right until you risk them and they work. This decision worked. The practice group is one effective team! When you have eyes of faith, Eddie is one of God’s missionaries. The wife in Proverbs is on mission in every one of her daily places. The psalmist senses what being on mission is like. It’s like being a tree planted by a stream of water. What you need is always there. James writes about people on mission should not do and what they should do. Eddie is on mission! Let’s be on our own missions! In every part of our daily lives!